Get a group of friends together and take a day trip to Mt Tamborine and visit some of the boutique wineries that make the region famous. Situated in the Gold Coast Hinterland, Mt Tamborine is approximately an hour and a half drive from Brisbane and an hour from the Gold Coast. 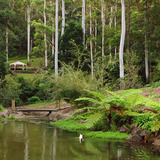 The Mt Tamborine region is famous for the tranquil rainforest and spectacular views over Nerang and the Gold Coast. If wine isn't your thing you can tour the other local cottage industries including a cheese factory, brewery, coffee plantation, art galleries, and chocolate and fudge stores. You can coordinate the trip yourself and hire a coach or minibus for the day or you can pick from one of the many guided tour packages on offer. Tamborine Wine Tours offer a great day package from $130 per person which includes pick up and return from the Gold Coast, a two-course lunch and free tastings at four wineries. If you have a small group of six or less you may like to try Cork 'n Fork Tours who offer full or half day packages starting from $100 per person. If you are going to be organising the tour yourself be sure to call the wineries before-hand, If you mention that you are coming with a group some will organise a discount on tasting or a private tasting session and cellar tour. You can organise a minibus or coach through Sunstate Charters or Brisbane Bus Lines. For a group of 10-12 you are looking at roughly $60 a head to cover your transport costs. Witches Falls is a family owned and operated winery located on the side of Mt Tamborine and is a little further away than the other wineries – for this reason I'd make it your first or last stop of the day. Witches Falls has picked up a slew of medals over the past few years and the winery is well-known for its Cabernet Sauvignon. If you have a group of 10 or more I'd highly recommend booking a private tasting session at $3 per person. I'm normally a white wine drinker but Cedar Creek swayed me with their fantastic selection of reds – if you prefer sweeter wines make sure you try their Revelation Red. Cedar Creek also offers online ordering and delivery to Brisbane when you buy by the case – which makes it easier than trying to transport a large order home with you on the day.